Have you heard about the “other” alternative to replace missing teeth? A dental implant is that solution! Today, replacing teeth with dentures or bridges is no longer the only option. Bridges are anchored to adjacent natural teeth (abutment teeth) and in the process may make them weaker over time. Bridges are more of a temporary solution, a solution that may require a bridge to be replaced more than twice in a person’s lifetime. Dentures could also be an inferior solution. Over time, the denture can cause facial bone loss which causes loss, ill-fitting dentures and may cause sores inside your mouth and on your gums. These removable appliances can be bulky, uncomfortable, catch food particles and can interfere with speech. Dentures are the leading cause of premature aging. Dentures can slip out of the mouth during times of eating, chewing and/or talking. 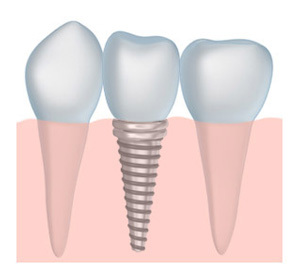 In today’s modern and proven dentistry, the best acceptable solution to tooth loss is the dental implant. The replacement of a single missing tooth to extensive reconstruction and replacement of several or even all teeth, dental implants offer the healthiest and most “peace of mind” solution. If you have dentures that are loose and unstable, hurt your gum and do not chew your food properly, dental implants are a great solution. The dentures can be anchored to dental implants to provide better stability. With new techniques this can be achieved in a short one-hour visit, with minimal flapless surgery. Quite often this is done, using a flapless procedure and immediate load dental implants. This means, no stitches are placed and a tooth is placed on implant right after surgery. Flapless procedure ensures the most esthetic result and creates gum tissue around the dental implant that resembles that of natural teeth. The goal of modern dentistry is to restore patient’s teeth to normal esthetic, comfort, function, speech and health. However the more teeth a patient is missing, the more challenging this goal becomes with traditional dentistry and the use of dentures and bridges. By using advanced dental implant designs, material and techniques, predictable success is now a reality for the treatment of many challenging clinical situations. For a complimentary dental implant consultation, call or email us today to schedule an appointment with Dr. Weber in Gainesville, GA. Dental implants may be the restorative dentistry option you need to smile with confidence.